If you wear makeup, you need to start with a primer like Younique Touch Glorious Face Primer. It’s A truly ‘Glorious’ product that prepares and enhances the skin for premium application of your makeup, especially mineral makeup. Without a face primer, your makeup is more likely to settle into your pores and fine lines. It can also make your skin look more dry than it would with a face primer. Younique Touch Glorious Face Primer creates a flawless canvas as it evens out the skin’s texture, and primes and prepares the skin for premium application of mineral makeup. The resulting appearance is porcelain-perfect, velvety-soft skin with incredible long-wearing, sweat-resistant coverage of mineral makeup that lasts all day. Ingredients are naturally based, free of parabens, oils, synthetic fragrances, and cheap fillers. Suitable for all skin types. 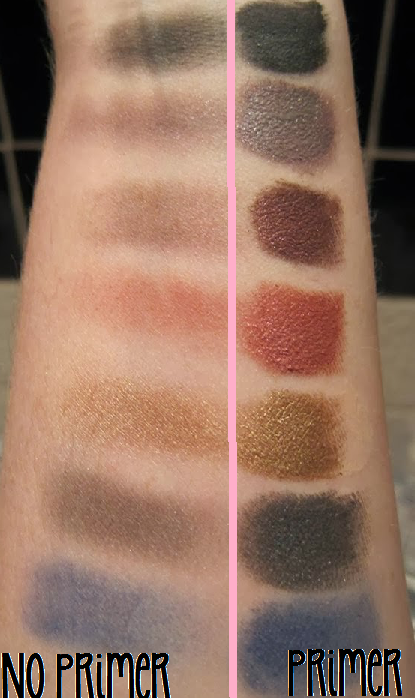 This photo demonstrates the difference in using Younique primer VS. no primer when applying eyeshadow pigments. Notice how much richer and bolder the colors are when they are applied over Younique Glorious Primer VS. bare skin. When Primer is applied before foundation the results are a much better. The skin looks smoother and imperfections like wrinkles and large pores are much less visible. Your makeup will last and stay on longer for an all day look. Younique Touch Glorious Face Primer Directions: Apply directly on skin prior to concealer, foundation, or makeup. Blend into skin using circular motions until primer is absorbed. Gentle enough to use all over face and around eyes. A small dime-size amount is sufficient for the entire face. Elastin functions as a good water-binding agent, which can help the skin hold in moisture. Dimethicone feels like silk on the skin as it works as an emollient (skin softener) and long-lasting water-binding agent. Trehalose is a plant sugar with water-binding properties for skin, as well as humectant (moisture preserving) and moisturizing benefits. Vitamin E is considered an antioxidant superstar. It is one of the most well-known and researched antioxidants. Hyaluronan boosts skin’s moisture content and helps to hinder moisture loss. Butylene Glycol is a commonly used slip agent that has multiple functions in cosmetics: humectant (moisture preserver), humidifier, and ingredient deliverer. Silk Crosspolymer has water-binding properties for skin conditioning.